H-7 Bennington Star, 25 pieces, paper pieced. H-10 Ben's Bowtie, 26 pieces, hand pieced. the French illustrator Rébecca Dautremer. I must be obsessed with her drawings!!!!!!!! H2, Jacob Anthony, 24 pieces and this one was hand pieced. H3, Berry Baskets, 24 pieces, Paper Pieced. Paper pieced into units, then hand pieced. H-4 Abbey's Eyes, Foundation pieced and hand appliqué, 7 pieces. H-1 Peek-a-boo, Foundation pieced, 20 pieces. 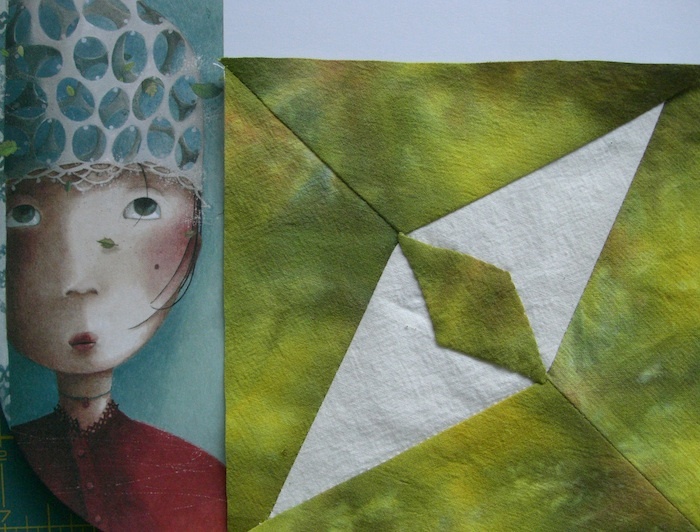 Both blocks are here with pictures from the illustrator Rébecca Dautremer. the list is endless, it is just matter of prioritize. Thank you for stopping my. H-13 Farm Fields, paper pieced, 7 pieces. 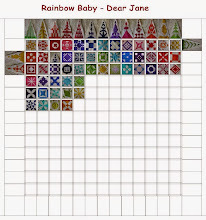 Now I have 100 blocks done for my DJ plus 12 triangles. Happy stitching and thank you for stopping by.